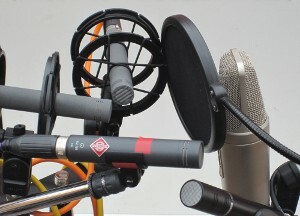 The Treewind studio is available for projects ranging from demos and individual tracks to whole albums. 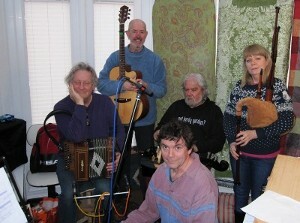 As a folk musician with classical musical training I'm most at home with traditional instruments and styles. 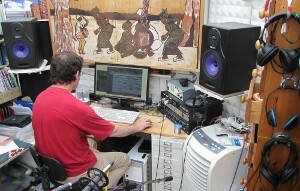 The studio is quite small but can accommodate instrumental groups of five or more people comfortably. We got six musicians + drum kit in the old studio in Cambridgeshire, and the new studio in West Yorkshire (completed in 2018) is bigger. The studio can be booked for any day of the week or weekend. Digital Audio Workstation using Ardour software on an AV Linux operating system, including several LinuxDSP (now OvertoneDSP) processing plugins, in custom-built PC based platform with 6-core CPU. - 2 x AKG C391B "Blue Line"
Yamaha AW16G 8 track HD recorder for on-location recording. Thanks to your mixing skills, Frog On a Bike are booked for Rochester Sweeps Festival this year! I just downloaded your complete album, it's really a PLEASURE to listen to it. Carry on, great arrangement, great mix, great instrumentals and ... a great singer. I will continue listening to it in my car tomorrow, when I will have a two hours trip to a studio in the west. I'm deeply impressed of your work ! I like that style a lot. I have to say we are thoroughly satisfied and very happy with what you did for us at the weekend. Compared with all other experiences we have had in studios, our time with you was relaxing and unstressful. You were thoroughly professional, set up equipment and recorded us efficiently and with the minimum of fuss, made helpful suggestions and perhaps best of all understood what we were aiming for, because you know our kind of music, our instruments and what they can and can't do. We can think of no ways in which you could improve on what you did for us over the weekend. Plus of course the tea and coffee and lovely lunches that Mary provided.